Yellow Jacket is an all new iPhone case that doubles as a powerful stun gun, zapping potential threats with 650,000 volts of electricity. Not only that, the case also doubles as an additional battery for the iPhone itself, providing up to an additional 20 hours of use – assuming you don’t use the stun feature of course. Sounds interesting, doesn’t it? The story behind Yellow Jacket is also interesting if not disturbing, apparently it was created by a guy who was robbed at gunpoint in his own home. That story and more are told in the slightly overdramatic promotional video embedded below, but it does a good job of showing the cases application as a self defense tool. As you probably expect, the Yellow Jacket case does add some additional bulk to the iPhone, totally about an inch thick and weighing 4oz. Even still, that could be a small price to pay for some added security for those who feel they need it. The Yellow Jacket stungun case will retail for $125 after it’s produced, but can be “pre-ordered” through IndieGogo at $85 and $100. Current versions fit the iPhone 4 and 4S, but more smartphones will be supported soon. We’ve seen some weird iPhone cases before, but this is certainly the most unique iPhone case I’ve heard of that actually serves a purpose. What do you think? 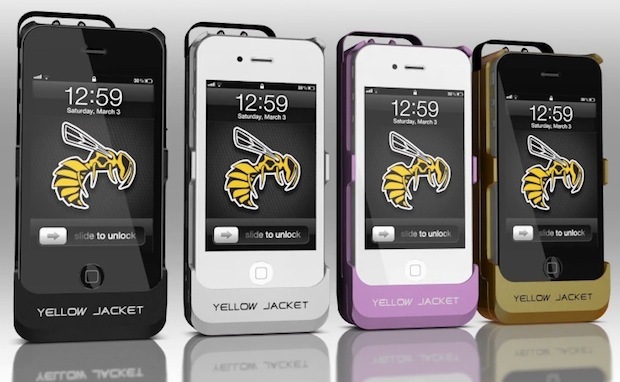 Would you want a stun gun case for an iPhone either for yourself or a loved one? just don’t accidentally zap yourself while talking on the phone. That was the 1st thing I thought when I read this. I can see where this would be seriously illegal to carry onto an aircraft. Someone here in Oz was arrested for having a “stun gun” that looked like a mobile phone. And the voltage wasn’t even close to this baby. I like the idea and I am not to sure it is a viable product because of the legal implications. In some states you need a permit to carry a stun gun. even so I’m just picturing sitting at the mall and watching some idiot pull his phone out and zap himself – would be so funny to watch. Perhaps the bad guys will get them too. Er!?! Isn’t this a double-edged sword? As soon as its available for The New iPhone, am all over this. Get real people and stop being Pollyanna’s. Wait til someone you know is robbed or worse. Criminals are armed. Shouldn’t you be?